VW aims to crank up U.S. production to meet demand for Passats. Volkswagen Group of America, amid rising sales of the redesigned Passat, will add 800 jobs at its U.S. plant to boost production of the mid-sized sedan. The move will increase the factory's work force to 3,500 by year end and push the automaker closer to its new goal of building more than 170,000 Passats annually in Chattanooga, Tennessee, by 2013. VW previously planned to build 150,000 Passats a year by 2013. VW declined to say how many Passats it will build this year or how many more cars it can produce with the additional staffing. Sales of the VW brand have increased 36 percent or more each month beginning with September, when the new Passat hit U.S. showrooms just months after production was launched. VW sales have soared 45 percent through the first two months of this year to 57,786 units -- one-fourth of them Passats. "Quite plainly, we need more Passats to meet the market demand," Jonathan Browning, CEO of VW Group of America, said in a statement. By 2018, the German carmaker aims to boost U.S. sales of its VW brand to 800,000 vehicles annually as part of its bid to become the leading automaker worldwide. The company also hopes to sell 200,000 of its Audi premium cars in the United States that year. Last year, VW brand sales rose 26 percent to 324,402 vehicles. VW spent $1 billion to build the Chattanooga plant. It opened in May 2011, marking the company's return to assembling cars in the United States after more than two decades. 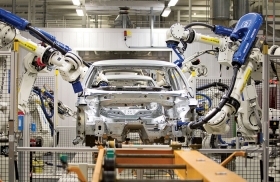 VW pledged to create 2,000 jobs when it announced plans for the factory in July 2008. The 800 new jobs will be a combination of production and administrative positions. They come on top of 200 posts announced in January, which also are being added to increase Passat output. The Passat, which was redesigned for the 2012 model year, is VW's only U.S.-built model. Through February, the company sold 14,507 Passats. The plant employs about 2,200 Volkswagen workers and an additional 500 employees from Aerotek, a staffing partner. The new production workers will add a third team to the factory's two-shift schedule, reducing the need for overtime. VW also said it will fill many of the new positions with current Aerotek contract workers. In February, VW executives told dealers that they want to crank up production in the United States by 50 percent this year, in hopes of boosting sales by about 150,000 vehicles. That would translate into a 46 percent increase in sales volume in 2012. Half of that increase -- about 75,000 vehicles -- is expected to come from the U.S.-built Passat, according to one dealer at VW's make meeting in Las Vegas last month. Overall, U.S. light-vehicle sales are up 14 percent this year through February, allowing the VW brand to boost its U.S. market share to 2.8 percent from 2.2 percent a year earlier.